BOOM! 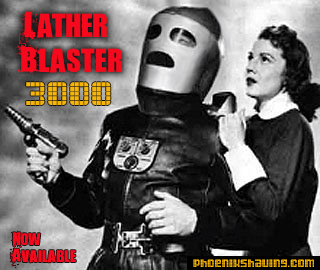 Lather Blaster 3000, The Official Shave Line of The Rich Man Shave Group! The original accord was Sandalwood, Bourbon and Tobacco Absolute and man was it epic...but to be honest, a little rough around the edges looking back. *So I decided to take it back to the perfuming table and refine it even more, take off certain rough edges & corners if you will. The kiss of Strawberry Aldehyde adds a nice touch of zing and plays really well with the tobacco note. The tree resins not only work as natural fixatives for the scent but also add a nice warm, vanilla-esque balsam and resinous note that wasn't there before. Lastly, the talc on top softened the Indian Sandalwood even more, making for a truly classic barbershop blend that melts like butter on the skin! *What really inspired Lather Blaster 3000 was one of my favorite traditional shave dens on Facebook, The Rich Man Shaving Group! Not only is this group filled with great, friendly people, but it is pretty unique in the fact that at any given moment, you will find someone on there doing a live shave! That alone really makes them stand out in my mind. Then there is their leader, Rich Hansen, Youtuber & Brush Handle turner! After building this humble little shave oasis and watching it grow for a little while, Rich thought it was high time to offer an official group soap, and he approached me. As I mentioned above, I was itching to revisit this scent and this was just the reason I needed. 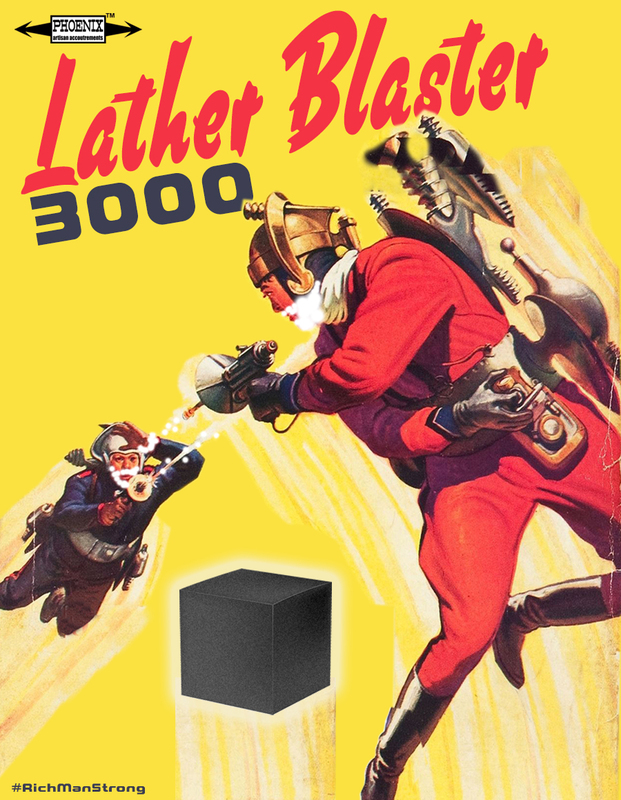 So with a new muse I went to work on Lather Blaster 3000! Once Rich caught his first sniff of LB 3K it was clear to us both that we needed to offer more than just a splash and soap...but an entire line! You need not be a member of the group to enjoy the fruits of it but I highly recommend you check them out...tell 'em Doug scent ya...I mean sent ya! Aside from playing with the original scent I also decided to play with the shape and energetics of Lather Blaster 3000 by the use of flower waters and plant extracts. Not only are these elements considered for their harmonic interplay it addition to the scent, but also as skin food. Many of you now know I do something pretty unique to the artisan aftershave world and distill my own hydrosols. This is a little bit of a process, but as you may have already noticed, it makes quite a difference when it comes to the quality of the aftershave/cologne! Having just released Supreme Sandalwood Science I have received many an email and PM in regards to my addition of fresh Indian Sandalwood Hydrosol. Folks and fans of the scent really took notice to the added depth of the aftershave...and I would have to agree, it was not in their heads, I notice it too, like a mystical presence. That said, I wanted to recreate that...behavior in another sandalwood forward scent-- Turns out I didn't have to wait that long to go at it again! Not to sound redundant, but it really adds a roundness to the shape of the accord, bolsters it up unforced, and quite naturally. Sandalwood also energetically is used historically as a mild astringent...BOOM! These are two of my favorite plant extracts right now due to the amount of skin benefits they are known to provide. The roots of the marshmallow plant contain a thick, gummy substance called mucilage. The mucilage is extracted from the root and used for many purposes. In addition to mucilage, the root extract contains a number of other ingredients that promote skin health, such as polysaccharides and flavonoids. MRE has been used in folk medicine for a long time to, to soothe the skin. Pomegranate Extract is known to fight free radicals and promote healthy skin cells, not to mention it is packed vitamin C that is loaded with skin loving properties! You will also find my skinfood touchstones, Vegetable Glycerin, a known humectant used to lock in moisture and Aloe Vera, a miracle plant used the world over for its beneficial properties! I sure also mention that the tree resins, like the sandalwood hydrosol, are also used often in tinctures and poultices as natural astringents! So much win in this bottle of AWESOME! As you can probably gather by now, a lot of thought and time went into Lather Blaster 3000 on my part and Rich Hansen's. You will immediately feel & smell the difference every shave ever after! Sorry, but this one cracks me up had to share too!